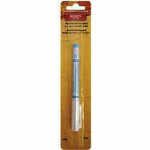 A blue extrafine point water erasable marking pen for use on light fabric. Use the Water Eraser Paintbrush 91779 to remove marking lines. Sold separately.